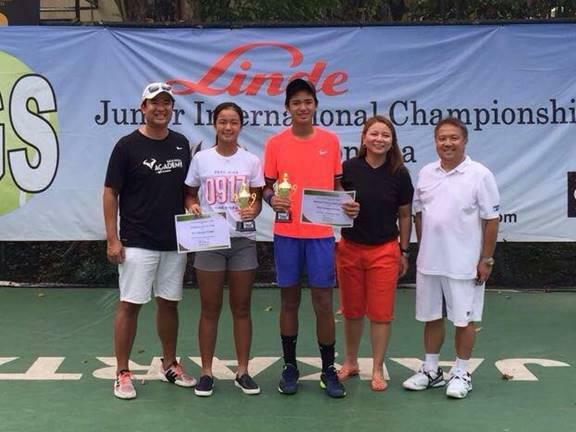 Alex Eala and Miko Eala, members of the Unified Tennis Philippines’ National Junior Team, impressed the crowd by making it to to the finals of the ITF-AGS Junior International Championships held at Jakarta, Indonesia recently by toppling higher-ranked players. Alex Eala (second from left) and Miko Eala (center) display their trophies. Alex dropped a 2-6, 2-4, 2-6 setback to top seed Priska from Indonesia, while Miko also yielded a 3-6, 7-6, 5-7 loss to top seed Matsushita of Japan. Alex, who recently turned 13, defeated older opponents such as Indonesian players, Nur Hadiati. Joleta Budiman, Janice Tjen as well as AI Yamaguchi from Japan and Aesha Patel from the US on the way to the finals, while Miko bested Kenneth Legacy, Muhammad Muzaqir, Karan Srivastava and Odeda Arazza from Indonesia, as well as Sohma Nakagomi from Japan. Miko also reached the semifinals of the doubles competition. “We congratulate Miko and Alex for proving that the Philippine team is a force to reckon with, we also commend the rest of the UTP national team who joined this tourney for exhibiting great sportsmanship and their passion for the sport. Rest assured that I and their UTP family will continue to support them.” said Jean Henri Lhuillier, president of the Unified Tennis Philippines. Other members of the team were Bea Acena, Manuel Balce III. Melanie Dizon and Macie Carlos. “Part of UTP’s mission is to continuously expose our emerging junior tennis players to global competitions, thus giving them the opportunity to hone their skills on and off the court against some of the world’s best junior players,” Lhuillier added. The International Tennis Federation–AGS Junior Tennis Championships were held in Jakarta, Indonesia and was joined by various countries all over Asia.